Grain Free Sandwich Bread garlic or plain, is a grain free, low carb, garlic flat bread. It can easily be plain sandwich bread too. 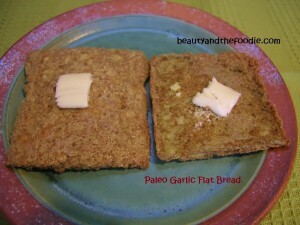 The garlic can be omitted for a plain sandwich bread. I would recommend baking this in the oven, as it turns out a little better. But, it can be made in a microwave as well. The only advantage is that in the microwave it seems to stick to the glass loaf pan less. It can easily be removed from the oven pan if you’re careful. 1 Clove Garlic minced, omit if making plain bread. 1/2 Tsp Garlic Powder omit if making plain bread. 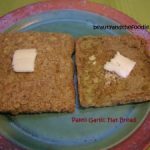 Put Coconut oil (or butter) in a loaf pan, then put 1 clove minced garlic in loaf pan, or omit garlic if making plain bread. Put loaf pan into preheating oven for a couple minutes to melt oil or butter. Take loaf pan with oil-garlic out of oven, set aside. Mix in a bowl: Egg, Milk of choice, Flax Meal or (Coconut Flour option), Sea Salt, and Garlic Powder. In a separate pinch bowl mix: baking soda and apple cider vinegar. Stir baking soda, vinegar mixture ( it will be fizzy). Pour baking soda, vinegar mixture into flax, egg mixture bowl. Pour mixture into loaf pan and swirl into oil and garlic with a spoon. Put loaf pan in oven and bake for 12 to 13 minutes, or can microwave for 1:30 to 2 minutes. Let cool a couple minutes, and take a knife and loosen around the edges of bread. 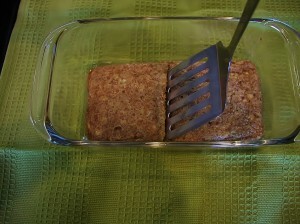 Use a spatula to cut across the center of pan, then slide spatula slowly under bread and lift (pictured above). Bread can be pan toasted or toasted in toaster oven (do not use a regular toaster). Hi, thank you so much for the recipe! Can I sub either whole or ground chia seeds for the flax? What would the equivalent be in measurement? Thank you! Heather, I’m not sure if ground chia would work, as I have not tried it yet in a bread. Holy moly it was so good! Thank you, thank you. I just made this and I’m pretty happy with it, and very thankful to have a morning “toast” alternative! I added a dash of cinnamon, but next time I think I’ll add more. I went ahead and toasted it in my toaster on the rack and pulled it out just as it began to drip. I was happy with the texture and I’ll definitely try this again. The only thing I’ll have to learn to live with is that’s a lot of dirty dishes for such a tiny little bit to eat! I’m going to try to scale up the recipe a bit and use a larger pan to ‘bake’ it in. Thank you very much for this! Hi Sara, thank you for trying the recipe and I know what you mean about dishes. Eating clean means many dirt dishes. I feel like I’m continually washing dishes. It is great to make bigger batches and freeze or refrigerate. Will almond flour work instead of coconut? Pyriel, yes you could use almond flour, just use 4 tbsp of it. You also say baking soda up top then in directos you say baking powder. Does it matter? Pyriel, yes that was a typo, thank you for catching that. :) I think I need an editor, as my typing is not great. :)it is baking soda not powder. Do you think this can be pan friend to make an Ethiopian injera-type bread? Hello KC, I haven’t tried it that way, but I’m intrigued by that method. So, I will try it. It may come out more like a crepe or wrap. Which would be very useful. Great idea! Let me know if you try it that way. I see. So that is the difference when cooking it with a microwave and an oven. Now I know which is the best option to use. Thanks a lot. I learned something important today. Hi Mary, the oven does brown the bread better, but the microwave makes it easier to remove from the glass loaf dish. Also, some of my friends are opposed to using a microwave so, I try to give options. Hope that helps you choose which method you prefer. This looks good, too! I will definitely be trying this soon. Thanks! Hello Betsy, I hope you like it as much as I do.